Although the printing press had been invented in 1450 by Johann Gutenburg in Germany (161 years before the 1611 printing), the equipment used by the printer had changed very little. Printing was still very slow and difficult. All type was set by hand, one piece at a time Backwards, by candle or Lamp (that’s one piece at a time through the whole Bible), and errors were an expected part of any completed book. Because of this difficulty and also because the 1611 printers had no earlier editions from which to profit, the very first edition the King James Version had a number of printing errors. As shall later be demonstrated, these were not the sort of textual alterations, which are freely made in modern bibles. They were simple, obvious printing errors of the sort that can still be found at times in recent editions even with all of the advantages of useless, but they should be corrected in later editions. In the section of Scrivener’s book dealing with the KJV “revisions,” one initial detail is striking. The first two so-called major revisions of the King James Bible occurred within 27 years of the original printing. (The language must have been changing very rapidly in those days.) 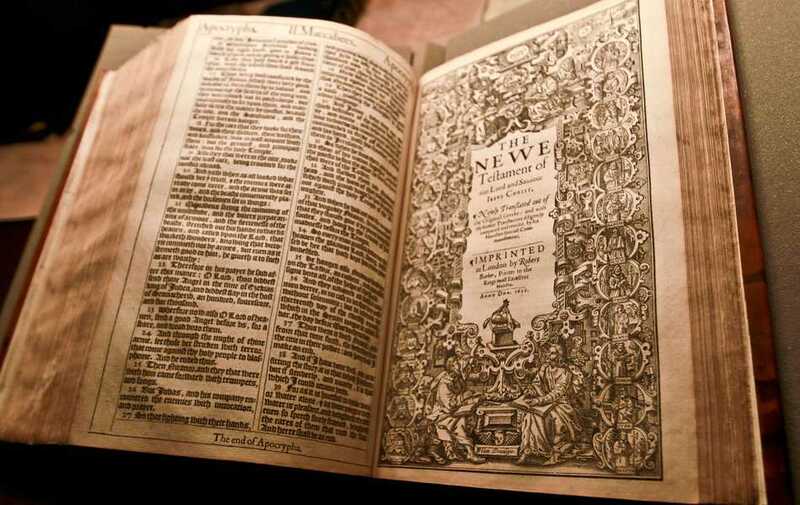 The 1629 edition of the Bible printed in Cambridge is said to have been the first revision. A revision it was not, but simply a careful correction of earlier printing errors. Not only was this edition completed just eighteen years after the translation, but two of the men who participated in this printing, Dr. Samuel Ward and John Bois, had worked on the original translation of the King James Version. Who better to correct early errors than two that had worked on the original translation! Only nine years later and in Cambridge again, another edition came out which is supposed to have been the second major revision. Both Ward and Bois were still alive, but it is not known of they participated at this time. But even Scrivener, who as you remember worked on the English Revised Version of 1881, admitted that the Cambridge printers had simply reinstated words and clauses overlooked by the 1611 printers and amended manifest errors. According to a study which will be detailed later, 72% of the approximately 400 textual corrections in the KJV were completed by the time of the 1638 Cambridge edition, only 27 years after the original printing! Please realize that a change in type style no more alters the text of the Bible than a change in format or type size does. However, the modern reader who has not become familiar with Gothic can find it very difficult to understand. Besides some general change in form, several specific letter changes need to be observed. For instance, the Gothic s looks like the Roman s when used as a capital letter or at the end of a word. But when it is used as a lower case s at the beginning or in the middle of a word, the letter looks like our f. Therefore, also becomes alfo and set becomes fet. Another variation is found in the German v and u. The Gothic v looks like a Roman u while the Gothic u looks like the Roman v. This explains why our w is called a double-u and not a double-v. Sound confusing? It is until you get used to it. In the 1611 edition, love is loue, us is vs, and ever is euer. But remember, these are not even spelling changes. They are simply type style changes. In another instance, the Gothic j looks like our i. So Jesus becomes Iefus (notice the middle s changed to f) and Joy becomes ioy. Even the Gothic d is shaped quite differently from the Roman d with the stem leaning back over the circle in a shape resembling that of the Greek Delta. These changes account for a large percentage of the “thousands” of changes in the KJV, yet they do no harm whatsoever to the text. They are nothing more than a smokescreen set up by the attackers of our English Bible. Before your eyes are 5% of the textual changes made in the King James Version in 375 years. Even if they were not corrections of previous errors, they would be of no comparison to modern alterations. But they are corrections of printing errors, and therefore no comparison is at all possible. Look at the list for yourself and you will find only one that has serious implications. In fact, in an examination of Scrivener’s entire appendix, it is the only variation found by this author that could be accused of being doctrinal. I am referring to Psalm 69:32 where the 1611 edition has “seek God.” Yet, even with this error, two points demonstrate that this was indeed a printing error. First, the similarity of the words “good” and “God” in spelling shows how easily a weary typesetter could misread the proof and put the wrong word in the text. Second, this error was so obvious that it was caught and corrected in the year 1617, only six years after the original printing and well before the first so-called revision. The myth that there are several major revisions to the 1611 KJV should be getting clearer.Only approximately 400 variations are named between the 1611 edition and modern copies. Remember that there were 100 variations between the first two Oxford editions which were both printed in 1611.